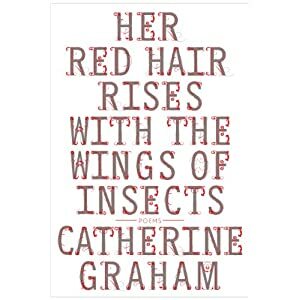 Her Red Hair Rises With The Wings Of Insects. Catherine Graham. Wolsak & Wynn Publishers. Hamilton, Ontario. 2013.
line of each of four ten-line stanzas." Then I started in on the poems themselves and proved myself wrong again.. I've often thought about you. to stand on the road for some goddamn reason. on your way through your own nocturnal route. I have so often thought about you. These poems resonate with absolute clarity, purpose and poise. Graham is as exact as NASA, and as elegant as P.K. Page. More about that in a minute. and spiny like cacti they sting the absence. where air floats cobalt blue or hot vermilion. like a doll from Bogata. and this rock where I outline a fossil of fish to carve his story. He's always leaving me and telling me he's coming back. "Soon," he says, pointing to the moon. But when it's full or empty? He doesn't answer. He says he'll write. These glosas are meant to pay tribute to P.K. Page and the Irish poet Dorothy Molloy. While I'm reasonably familiar with Page, I don't know Molloy's work at all. Fortunately that doesn't really matter as Graham has seamlessly packaged all this. She has the technical mastery to make the glosas disappear - what I mean is that the technique vanishes and we are left with strong, vibrant poems that aren't bridled by technique. There is humour, wit, sensual experience, fantasy and grace in these poems. Hard to ask for more than that. It is also a delight to read, to recommend. And I'm certain P.K. Page and Dorothy Molloy would both be chuffed. There is a stir, always. Catherine Graham is the author of four previous collections of poetry. "Graham dives sensually into experience and enables the reader to follow. She writes what happens so that it happens again." "One of Toronto's brightest poetry minds." "Graham utilizes images from fantasy and nature, working these poems to mine a quarry of loss...And Graham writes that loss into startling poems." "More goose bumps per page than any collection in recent memory." "Graham tells such incredibly layered stories with so few words that I'm constantly blinking in amazement."